"Bruce Wayne loses his philanthropic parents to a senseless crime, and years later becomes the Batman to save the crime-ridden Gotham City on the verge of destruction by an ancient order." Last week, in preparation for "The Dark Knight Rises", I watched a marathon of "Batman" movies. Unfortunately, I ran out of time to review them all during my "Batweekend". I might have made my deadline if it hadn't been for the length of Christopher Nolan's versions of the Dark Knight. There are two things I cannot abide. The first is any movie which is over two hours in length. Some of us need the toilet quite regularly and having to hold it in at a movie theatre doesn't make for a very enjoyable experience. The second is any movie starring Cillian Murphy. So can you possibly guess how thrilled I was to watch a two-hours and ten minutes long movie starring, among others, Cillian Murphy? This was torture! At least it was on DVD and I could pause it and go to the toilet whenever I wanted. Of course, I'm not going to spend much time reviewing "Batman Begins". I'm not a huge Batman fan, I've never read any of the comics, and my "Batman" (if I had to choose one) was Adam West not Christian Bale. 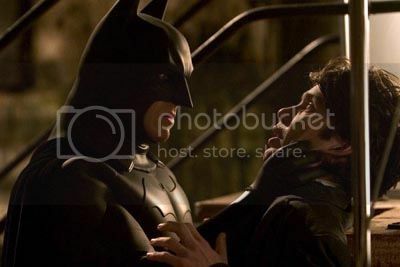 It's easy for me to find things which I hated about 'Batman Begins". I hated having every single detail of how Batman came to be explained, I hated the vertigo-inducing helicopter shots of New York, I hated the music being cued inappropriately, and I hated the way the movie looked. Finding things I did like is even easier because there weren't that many of them. I liked the way the story was quite self-contained and tied-up things from the beginning at the end. In particular, I'd forgotten all about Ra's al Ghul and the vapour from the blue flower which caused hallucinations. I also liked the clever way that Bruce Wayne turned the tables on Earle (Rutger Hauer). As far as the acting went, it was good. The effects and action scenes were okay. The background music was horrible. The cinematography might have been great on a big screen or on Blu-ray with a massive HDTV, but, for me, with the DVD and a 42" LCD TV, I thought it was too dark, colourless and kind of grainy in that horrible CSI-style which was so popular at the time. Maybe it's just my setup though. I've got the 2-disc "Deluxe Edition" on DVD and have no interest in any of the special features so that's all I have to say about "Batman Begins". I highly doubt that I'll never watch it again.